University of Maine interim head coach Nick Derba talks to the dugout during their baseball game against University of Hartford at Mahaney Diamond in Orono, April 8, 2017. The University of Maine’s baseball and softball teams were each picked to finish fourth in their respective America East preseason coaches polls. In the baseball poll, Hartford was picked to defend its title. Hartford had 35 points and five first-place votes from among the league’s coaches. The Hawks were followed by Stony Brook (32 points, 2 first-place votes), University of Massachusetts at Lowell (25), UMaine (18), University of Albany (15), Binghamton (14) and Maryland, Baltimore County (8). The top six teams qualify for the tournament May 22-25 in Binghamton. In softball, UAlbany was chosen to defend its championship, earning 34 points and four first-place votes. UMass Lowell (32, 3 first-place votes) was second followed by Stony Brook (24), UMaine (21), Binghamton (18), Hartford (10) and UMBC (8). The top six teams qualify for the softball tourney, which will be held May 8-11 at a site to be determined. Both UMaine teams have key personnel to replace. The baseball team must replace the likes of All-AE first-team catcher Christopher Bec and second-teamers John Arel, a pitcher, and shortstop Jeremy Pena. UMaine went 20-34 overall, 12-12 in AE, and was 2-2 in the conference tourney. The softball team has to fill the voids left by the departure of All-AE second-team pitcher Annie Kennedy and outfielders Erika Leonard and Rachel Carlson. The UMaine women were 22-25 (9-7 AE) and went 2-2 in the conference tournament. 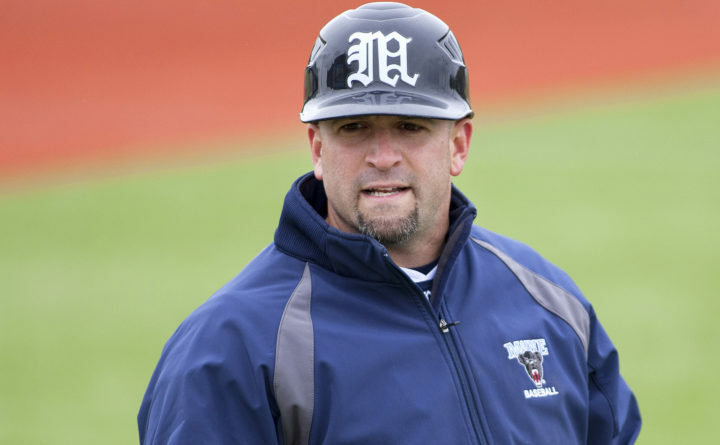 Baseball coach Nick Derba’s roster will include 12 freshman and softball coach Mike Coutts’ team will have 10 newcomers. The baseball team’s list of returnees will be headlined by senior third baseman Danny Casals and junior right fielder Hernen Sardinas. Casals, a first-team All-AE pick last season, hit .302 and led the team in homers with 14 and runs batted in with 49. Sardinas, a second-team selection, hit .312 with seven homers and 37 RBIs. Bangor senior Justin Courtney (1-1, 2.57 earned run average) is recovering from Tommy John surgery and Derba is hopeful he will be ready for conference play. Cody Laweryson (3-3, 3.42) of Valley High in Bingham will move from the bullpen to the starting rotation and senior Nick Silva (3-6, 6.10) has a ton of experience. Matt Geoffrion (1-2, 5.16, 2 saves) was an All-Rookie team choice. On the softball team, seniors Laurine German (.307, 0 homers, 13 RBIs), who was the shortstop a year ago, catcher Maddie Decker (.256-4-24) and third baseman Alyssa Derrick (.230-8-34) head up the list of returnees along with sophomore pitcher Kyleigh O’Donnell (6-8, 3.24 ERA). German was a second-team All-AE pick and O’Donnell earned a spot on the All-Rookie team. The baseball team opens at Florida State on Feb. 15 while the softball team takes on the University of Texas San Antonio on Feb. 22.